On August 28, residents of London's east end celebrate Meadowlily Bridge's 100th birthday. The metal truss bridge has stretched over the south branch of the Thames since 1910, once providing a route for area farmers to deliver milk or visit London's market. Now for pedestrian use only, the bridge is located inside Meadowlily Woods Environmentally Significant Area. When I visited, I had the astonishing sensation of strolling down a tree-lined country road to the London of yesteryear. Meadowlily was constructed by Isaac Crouse, the same man who built Blackfriars Bridge. Though not as important as Blackfriars (London's oldest iron bridge dating back to 1875) Meadowlily is still of historic significance for eastenders. We have a few other oldies as well, like the King Street Bridge dating to 1897, the Sarnia Road Bridge of 1909 or the Thames Street Railroad Overpass of 1889 (my personal favourite - it looks so ancient). 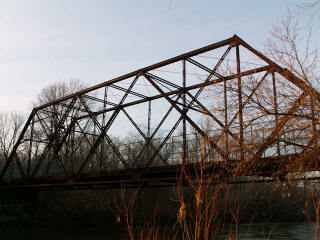 Info on Meadowlily and other bridges may be found on http://www.historicbridges.org/, a Michigan-based website that records historic bridges in surrounding states and Ontario. But prepare yourselves. The webmaster doesn't have high praise for Canada's bridge recording track record: "In Canada, there does not appear to be such a requirement in place that mandates the evaluation of all bridges in the country...it seems that agencies like the Ministry of Culture do not even know about the bridges in the first place. If the local counties, townships, or municipalities want to consider their bridge historic and preserve them, or consider them non-historic and demolish them, that is their own decision." What Canada needs, it seems, is an historic bridge inventory, a list of all bridges over 50 years old, so that structures on the list may then be evaluated for significance.